These roll ups were the perfect dinner. 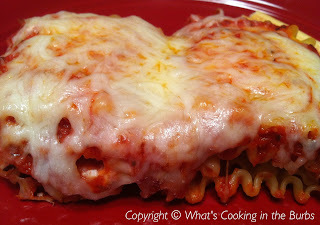 They combined two of my favorites, pizza and lasagna. They were also really easy to prepare and a hit with the toddler too! Place noodles in a 13x9 casserole dish. Combine ricotta cheese, oregano, garlic powder, pepper, and 1/2 the shredded cheese. Spread 1/4 cup over each noodle to within 1/2 in. of edges. Add pepperoni and roll up. Place seam side down. Top each roll with pizza sauce. Cover and bake at 350° for 20-25 minutes or until bubbly. Uncover, sprinkle with remaining cheese. Bake 5 minutes longer or until cheese is melted. Let stand for 5 minutes before serving. Enjoy! I love the flavor combinations. Yum! Wow! Win I clicked this I thought sinfully delicious. Turns out there is not a lot of sin. A win/win. I am glad I saw this at Foodtastic Friday.